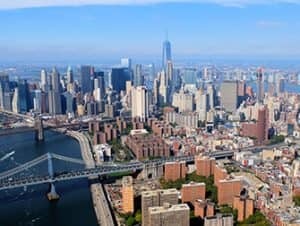 The no door helicopter tour in New York is a really unique way to see the city. During this flight by FlyNYON you can take some really impressive photos of Manhattan. If you are looking for an unforgettable experience, an adrenaline rush or if you have a special occasion to celebrate in New York, this helicopter flight is the ultimate activity. The helicopter doesn’t have any windows or doors, so you can literally dangle your legs over the city, if you dare, of course! Taking aerial photos of Manhattan is fantastic with this flight because there are no obstructions or window reflections. 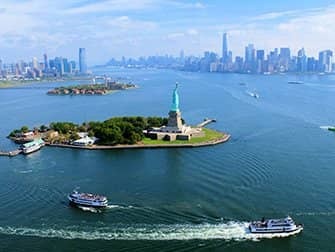 This is the best helicopter tour in New York for budding photographers and for anyone who is looking for that extra something special. From the air, you have an amazing view over New York. It is a fantastic opportunity to get a birds eye view of the skyscrapers, Brooklyn Bridge and the Statue of Liberty. This flight is approximately 15 minutes and will show you all of the highlights of Downtown Manhattan. In addition, with the absence of doors, there is nothing to obscure your view. It even gives you the opportunity to take a great ‘shoe selfie’ with the Statue of Liberty literally at your feet! All cameras, telephones and other loose objects will be secured by a cable, so don’t worry about dropping anything. The departure airport is located in New Jersey, a short drive away. 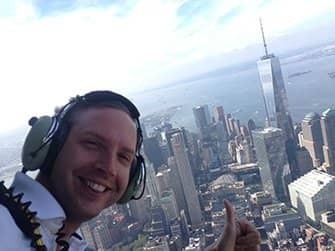 Eric’s Tip: I have had the opportunity to experience quite a few regular helicopter tours in New York, so was very curious about this one. I loved it! It’s a whole different experience than the other flights. Definitely an activity for the ‘dare devils’, photographers, or people who, just like me, have experienced the ‘normal’ helicopter flights and want to try something a bit different. And this flight is even cheaper than most regular helicopter flights! After booking you will receive a voucher by email, you can print this out or show it on your mobile phone as your ticket for the tour. Age restrictions: The minimum age for an open door seat is 12. Those under the age of 18 require parental consent. If you think 15 minutes is too short, for example if you’re a photographer and really want to take your time to take some nice aerial shots, then there’s another option for you. This flight takes approx. 30 minutes, offering you a great opportunity to photograph all of Manhattan from the air.